We are seeking new writing, essays, creative interpretation, reviews, interviews and photographic work that explore and respond to the title and theme ‘A God Complex’. 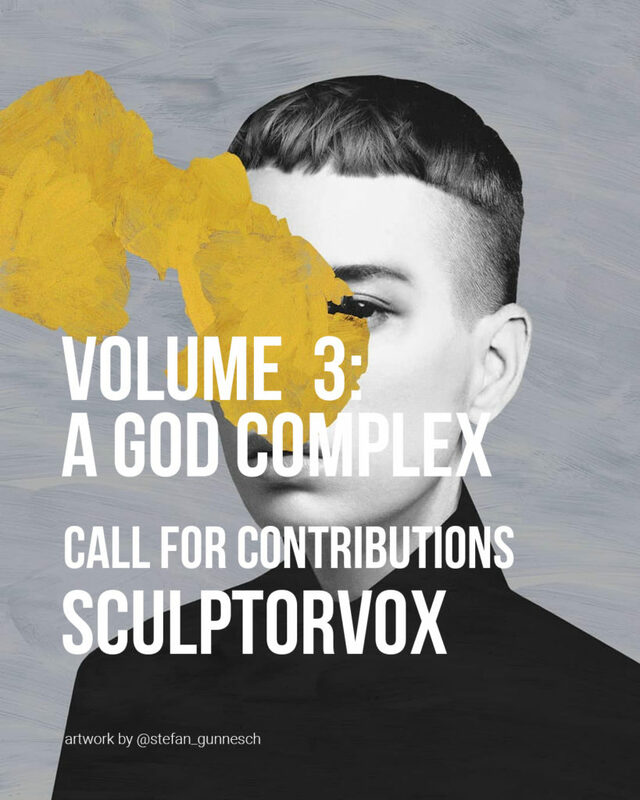 You are invited to submit work that expresses notions, ideas and theories on ‘A God Complex’: aspects of the human ego, narcism, creation, transcendence, allure, seduction, religion, elitism, either lateral or literal. Sculptorvox is an 8 volume series going beyond seeing sculpture as ‘object’ and delves into the world, work, inspiration, processes, influences, ideas, journeys and careers of artists, writers, photographers who all work directly or indirectly with notions of three dimensions. From interviews and articles to original writing, thinking and photography that goes some way to show the breadth and depth of practice in contemporary studios. Please see the website for further information and submission guidelines. Sculptorvox is a print first publication. In addition to the general submissions guidelines below please read our style guide. These give you the basic protocol for our preferred writing style and details of image size/quality. Thank you for considering submitting work. Sculptorvox takes a ‘people first’ approach to artistic output turning the established ‘artwork first’ idea on its head, presenting compelling stories of the artists and intimate articles on the psychology and philosophy imbued in the process…asking what is it to create, derive a method, forge a path. Ultimately the publication explores the mind, ideas, motivations, desires, passions, doubts, conflicts and underlying journey of the contemporary sculptural artist: presenting their voice and viewpoint, artworld expectations and attitudes, notions of success, career paths and new and alternative ideas. We will feature, from around the world, the personal viewpoints of a range of inspiring individuals (including but not limited to artists, gallery directors, curators and academics) through strong image and text based content. We are looking for writers who take a literal and/or lateral approach to writing about sculptural practice in all its forms, identifying outlying topics or responding to a particular theme for a chosen volume. We want writing that is acerbic, witty, irreverent, enlightening, challenging, leftfield, out-of-the-ordinary, unconventional. We only feature original and unpublished work both in print and online. We are looking for photographers who set out to capture images with a fresh perspective, authenticity and focused narratives. Portrait work should take the artist out of the gallery or studio space and show them in the places where they live and socialise, in line with our ‘people first’ approach. Photojournalism and photo essays may take a freer view on the context and approach for a specific idea or series of images, We seek original and captivating photographic work, and prefer to feature previously unpublished imagery both in print and online.